Temperatures in southern Europe (Spain and Portugal) are forecasted to hit 45°C (113 °F) later this week, continuing a long stretch of July and August heatwaves which hit the ‘old continent’ in 2018. After earlier forest fires decimated parts of Sweden and Greece already and their respective governments called upon the EU for extra support, now it is the farmers in various EU member states asking for extra help as they see their crops struggling because of a very persistent drought. In Germany, the farmer’s union asked for $1.2 billion of extra support. Their association’s (DBV) President, Mr Joachim Rukwied, claimed: "We expect billions in losses." Related coverage: <a href="https://thegoldwater.com/news/32571-Trade-War-New-European-Commitment-To-Instantly-Purchase-US-Soybeans#32589">EU Buys US Soybeans</a>. "The government needs to declare a state of emergency so that farmers in areas hit hardest by the drought can be helped directly with cash aid." According to their statistics, German farmers expect the grain harvest to be 20 percent smaller than last year, with rapeseed crops down a smashing 30 percent. Other crops are also expected to be affected. The German Food and Agriculture Minister, Ms Julia Klöckner wants to wait for the harvest report in late August to come in before she makes any rash decisions. She claimed that only "then we will have a real overview of the situation in Germany." She did note that local German governments could already offer extra support should they deem such necessary. Meanwhile in Sweden, the government allotted some $137 million extra help for the country's farmers hit by the extremely dry weather. Finance Minister Ms Magdalena Andersson: "We are presenting a national crisis package to Sweden's farmers." "The effect of the extended drought on pastures is causing a shortage of coarse fodder for the animals. And that makes us feel great concern for the Swedish food supply." Although the Swedish Farmer’s Association welcomed the package, their chairman, Mr Paul Borgstrom, complained that because of ‘red tape’ the monies would take too long to arrive. Mr Borgstrom: "Each krona is valuable in this situation, it helps liquidity, but you could also hope that the money would come to the companies even faster." Over in the north of Europe, the new Baltic members have also been hard hit by the constant heatwave. Lithuania declared a state of national emergency over the prolonged period of drought, allowing it to call on the EU Commission for help faster. Crop losses are estimated to be around 15 to 50 percent. 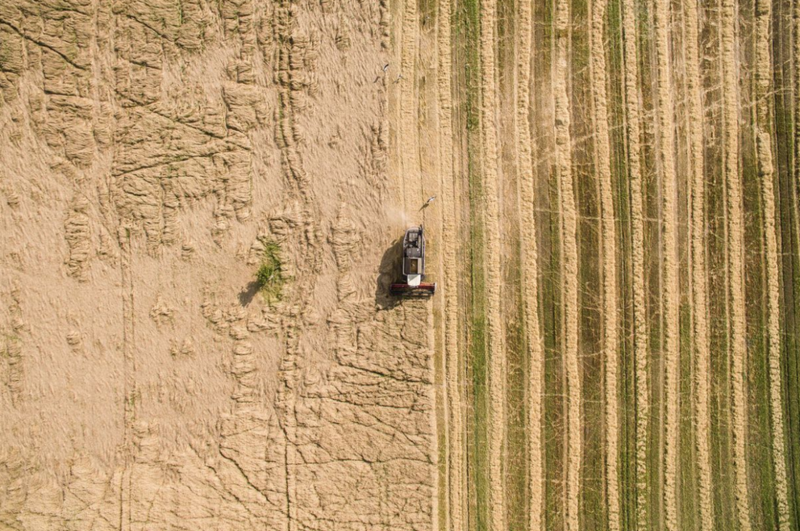 Neighboring Latvia had already declared such a national state of disaster in its agricultural sector last month. Banks in Latvia are therefore forbidden to foreclose on farmers, who will get help from the government to finish development projects in time to secure EU funding. Seeing this I often wonder if putting USA grown Corn in our gas tanks should be seriously rethought. Right now 8 out of every 10 ear's of corn are used for GAS Additive. If you want to bribe a nations people? Using FOOD that goes into their bellies always works better. Excellent point. These industries need some space to acclimate to a new, sensible business environment. Heat waves come usually in cycles. If you can get a hold some UN-FUDGED Weather data, many of the Global Freezing, Global Warming, Global something doomsayers would have to fess up. Remember back in 1970 we were told the Earth was going to be in an ICE Age by 1999-2001. The they came up with Global Warming and all the artic Ice gone by 2012-15. Now they are trying to use a Generic Term "Climate Change". Which is whatever the weather is for that month. Since I was a kid living in Eastern Middle GA. we I have seen 5 Ice storms, and a good Snow fall every 6 or 7 years. Drought have come and gone and will likely 2 more times before I am scattered to the winds in the 15 years. It is the same all over most of the average livable earth zone.